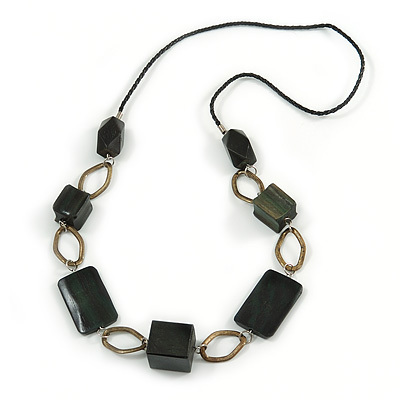 The necklace made of various shape wooden beads in hues of dark green and decorated with bronze tone oval links. All beads connected to a black braided cotton cord. The necklace measures about: 90cm Long. And an easy-to-wear, no fastening so can be slipped over the head. A must have item for those serious about wearing costume jewellery and also makes a perfect gift.